IITA joins the world in celebrating on 11 February the fourth International Day of Women and Girls in Science themed “Investment in Women and Girls in Science for Inclusive Green Growth.” According to the United Nations, a significant gender gap has persisted throughout the years at all levels of science, technology, engineering, and mathematics (STEM) disciplines all over the world. Although women have made tremendous progress towards increasing their participation in higher education, they are still underrepresented in these fields. 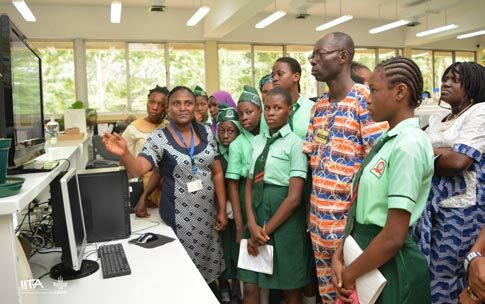 IITA’s continuing efforts to ensure gender parity across the Institute has given rise to many initiatives that are bringing recognition to female scientists. An important aspect of fostering women’s participation in science is the sensitivity of the leadership at IITA to gender needs. While speaking on IITA gender policy enacted in 2014, Nteranya Sanginga, IITA Director General, described women’s participation in science as one which is not only fundamental, but also a necessary foundation for a peaceful, prosperous, and sustainable world. Several factors contribute to the disparity between males and females in science, many of which are sociocultural. According to Bussie Maziya-Dixon, IITA Nutrition Specialist, “participation of females in science and technology is necessary, but socialization and traditional roles assigned to the girls at birth still determine the level of participation of girls in science because the life of the person is influenced or affected by sociocultural norms.” The culture learned directly or indirectly to a large extent determines how the person thinks and feels as well as his or her actions and outlook in life. With activities such as education and public awareness-raising, the International Day of Women and Girls in Science aims at promoting the full and equal participation of women and girls in education, training, employment, and decision-making processes in the sciences.